If you routinely stand in front of your busting-at-the-seams closet with a blank look on your face because you have too many options and nothing to wear, it’s time to make some changes. Save yourself a trip to the Container Store. Don’t worry about installing an IKEA system storage solution. You only need three steps to a clean, cohesive and clutter-free closet. Let’s take the C in closet and really celebrate it. 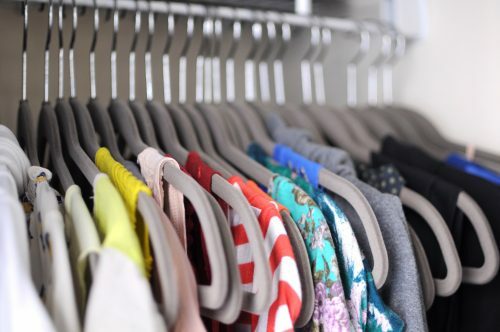 Here are the three C’s of closet organization; this is all you need to streamline your entire c-c-c-closet! 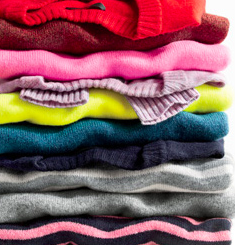 Condensing your closet is easier than you think. Take out each item and ask yourself would I buy this now? If the answer is no, it goes. Seriously. Don’t look at something and imagine wearing it five years from now when it comes back in style. If you are a slave to trends you need to give yourself limitations. Do you need a dozen trendy pieces every season? No. Allow yourself one or two and keep the rest of your wardrobe timeless. You should know what looks good on you. What styles and pieces do you find yourself reaching for consistently. If you love the way you look in a crisp white shirt and a cropped skinny pant or legging…why are you filling your rack space with wide-leg pants and crop tops? If you love a deep V then get rid of the turtleneck sweaters. Be honest with yourself…you’re not going to wear something you don’t look and feel great in…so get rid of it. Maybe invite a friend over for a bottle of wine and a try-on session. But remember, if you don’t love it, then let it go. At the end of step one you should have three piles (including shoes)… One for keeping (these pieces can actually stay in your closet for step 2 and 3), one for donating and one for re-selling—because you probably have some expensive designer pieces in there that someone else wants to overstuff their closet with…and why shouldn’t you make a little cash? Try consignment shops for the high-end items and Ebay for the rest. Categorizing your closet is also crucial to actually see what you have (and what you have too much of). Once you have condensed your closet you should separate everything into categories. Don’t get too specific. 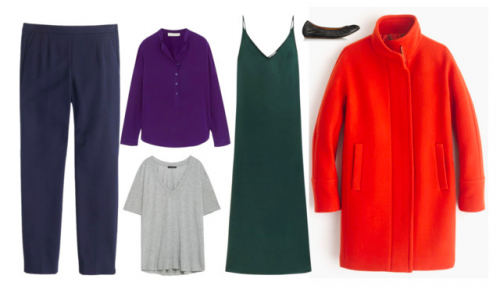 You can be broad: tops, bottoms, dresses, outerwear, shoes. Shoes should be lined up on the floor or (for space starved folks) in one of those over-the-door organizers (This one is the least offensive looking). You also don’t need to sub-categorize by long sleeve, short sleeve, high-heel, flat, or pants and skirts because you can just see what they are by looking at them. And since there will be a lot more space you can actually see everything. If you start separating everything by length and style then the closet is back to looking haphazard again. Just keep it simple. Rainbow (roygbiv) above from left: Red Peplum Blouse (Zara $40); Orange Sleeveless Blouse (Zara $26); Yellow Top (Zara $23); Green Top (Zara $20); Blue Top (Zara $23); Indigo Top/dress (T by Alexander Wang $142); Violet top (Diane Von Furstenberg $270). Color-coordinating is the last but most important step. This is easy and fun. For each category put the items in rainbow order. Start with the shades: white, gray, black…then red, orange, yellow, green, blue, indigo, violet. Whatever the dominant color of the piece is, it goes in that category. Reserve a section at the end of each category for wild prints, where there is no clear dominant or background color: If you have a teal striped dress, it goes in green. A gray sweater with tiny white stripes goes in gray; black dress with white polka dots goes with black…you get it. Above from left: White shirt (Uniqlo $30); White-stripe shirt (Top Shop $300); Stripe shirt (T by Alexander Wang $140); Gray marl shirt (Zara $40); Black stripe shirt (Zara $20); Black floral shirt (Anna Sui $300); Black tank (J.Crew $23). The reason why this step is so great is that it is also a stand-alone step. If you simply refuse to get rid of anything and can’t seem to categorize, you can always just color-coordinate the entire closet for some clarity. This will help when you’re looking for something black to wear, for example. 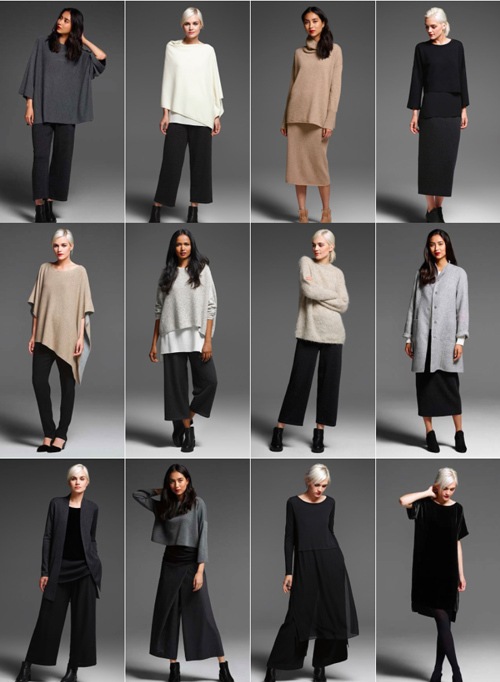 If rainbows make you dizzy, you can always take a page out of the Eileen Fisher stylebook and stick with neutral shades. Maybe it is the minimalist in me but I am loving all of the EF 2015 Fall/Winter looks. 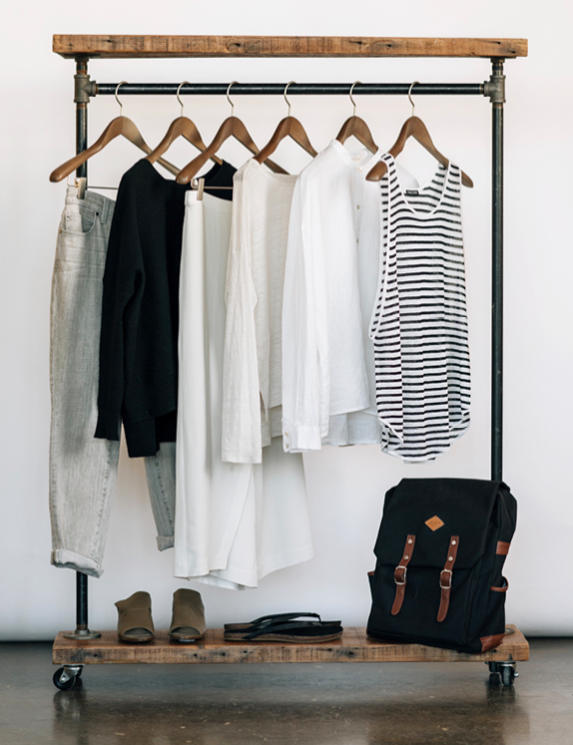 Once you have condensed and categorized and color-coordinated your closet the space will look neat and orderly and above all: visually cohesive. This will make selecting your outfits a less stressful experience… and you can start living your life again! A quick note on hangers: Every article you ready about closet organization suggests investing in good hangers. Sure, it would be nice to have sleek matching hangers, but honestly this not a priority and won’t help you pick an outfit. I appreciate a quality felt hanger just as much as the next clotheshorse; the items stay put and they make your closet look uniform and clean. But if you don’t have the budget for expensive hangers then you can skip this step. My only advise is to rid your closet of cheapie plastic or dry-cleaning wire hangers because they can ruin your clothes.